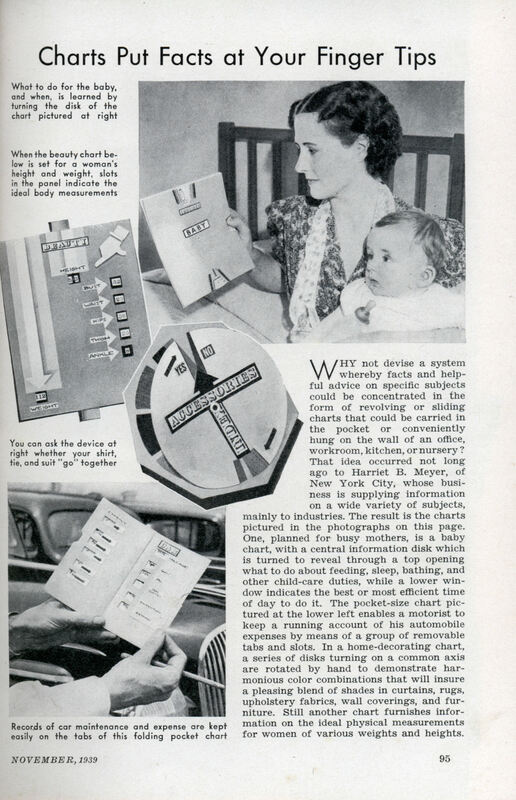 WHY not devise a system whereby facts and helpful advice on specific subjects could be concentrated in the form of revolving or sliding charts that could be carried in the pocket or conveniently hung on the wall of an office, workroom, kitchen, or nursery? That idea occurred not long ago to Harriet B. Meyer, of New York City, whose business is supplying information on a wide variety of subjects, mainly to industries. The result is the charts pictured in the photographs on this page. One, planned for busy mothers, is a baby chart, with a central information disk which is turned to reveal through a top opening what to do about feeding, sleep, bathing, and other child-care duties, while a lower window indicates the best or most efficient time of day to do it. The pocket-size chart pictured at the lower left enables a motorist to keep a running account of his automobile expenses by means of a group of removable tabs and slots. In a home-decorating chart, a series of disks turning on a common axis are rotated by hand to demonstrate harmonious color combinations that will insure a pleasing blend of shades in curtains, rugs, upholstery fabrics, wall coverings, and furniture. Still another chart furnishes information on the ideal physical measurements for women of various weights and heights. 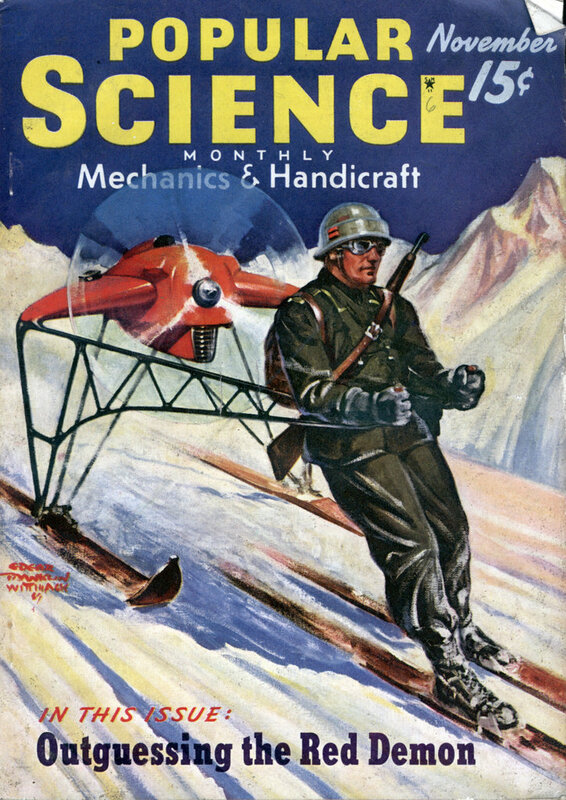 While these whiz wheels (as we called them in the Army when we used them for such things as ballistics computation) can be handy for some uses, how many times is a woman going to need to calculate her “proper” bust and hip size for her height? This gives me a great idea-I’m thinking of creating the Wiki-DiskÂ®, two over-lapping round blanks that you can put in any sort of numbers and data and change at will. Exactly how useful is it to know what your measurements “should” be at a certain weight and height? Your body doesn’t care what some calculator says: a woman at 5’3″ and 112 lb. could be 36-23-36, but she could also be 34-27-34 (more likely, actually) or 38-21-34 or really anything thinnish. What do they propose she do if she doesn’t measure up: shave her hip bones?